Our range of products include manual conveyorised powder coating plant and automatic conveyorised powder coating plant. 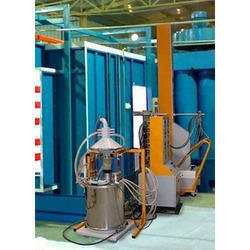 We Offer’s Manual Conveyorised Powder Coating Plant. A simple Overhead Chain Conveyor passes through Powder Coating Booth and Oven and coating is done with manual Spray Guns. Conveyor speed is worked out based on production rate required and oven can be straight tunnel type or with loops inside it. The conveyorised applications give better and uniform coating qualities with better process controls. For large size components as openings are large camel back oven is recommended wherein heat losses are minimized. Normally up to 1mt speed this plant is workable. 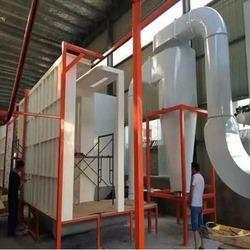 We Offer’s Automatic Conveyorised Powder Coating Plant this is similar to abode but coating /painting is done with the automatic Guns / Applicators. Here Conveyor speed is high and it is impossible to coat the entire component manually. The guns are mounted on reciprocators and it is synchronized with conveyor speed. Auto applicators are beneficial due to automation and saving in powder/ paint. Further coating quality is superb as uniform coating is possible. In all cases oven can be electrical / gas fired or diesel fired depending upon availability of fuel. Looking for Conveyorised Powder Coating Plant ?